Ada pertanyaan untuk Rydges Gladstone Hotel? Ketika mengunjungi Gladstone, Anda akan merasa layaknya di rumah ketika berada di Rydges Gladstone Hotel yang menawarkan akomodasi berkualitas dengan layanan luar biasa. Dari sini, para tamu dapat menikmati akses mudah ke semua hal yang dapat ditemukan di sebuah kota yang aktif ini. Para pengunjung ke hotel ini dapat menikmati berjalan-jalan di obyek wisata populer kota ini: Perpustakaan Gladstone, Gladstone Regional Art Gallery & Museum, Gladstone Art Gallery & Museum. Singkatnya, semua pelayanan dan fasilitas yang Anda harapkan dari Rydges Hotels & Resorts sangatlah nyaman bagaikan di rumah Anda sendiri. Sejumlah pilihan fasilitas kelas atas seperti WiFi gratis di semua kamar, resepsionis 24 jam, fasilitas untuk tamu dengan kebutuhan khusus, check-in/check-out cepat, penyimpanan barang dapat dinikmati di hotel ini. Hotel ini memiliki 80 kamar yang didesain dengan indah. Banyak kamar memiliki televisi layar datar, akses internet - WiFi, akses internet WiFi (gratis), kamar bebas asap rokok, AC. Daftar lengkap fasilitas rekreasi tersedia di hotel termasuk kolam renang luar ruangan. Rydges Gladstone Hotel adalah pilihan yang cerdas bagi para wisatawan yang berada di Gladstone dan menawarkan pengalaman menginap yang menenangkan setiap saat. This is a quality country hotel in central cbd location. It's one of the first major luxury hotels built in Gladstone. Hotel is a bit dated due to its age but very happy with my stay. Good views, great staff, nice pool. Restaurant is a bit expensive, as are all hotels, but high quality of staff and food is provided and there's a happy hour at the bar from 5-6pm. Would recommend this hotel especially for short stays and would definitely stay again. Great for business, central location clean and staff were helpful. Rooms are dated so if it’s a ritzy room for a weekend stay then there’s probably others that fit the bill, room cost is reflective of this. Otherwise it’s get what you pay for! Fantastic hotel, great location, great staff. Most comfortable beds and very modern room with beautiful water views. Will definitely staff again. Lovely, helpful staff, parking was very exposed. Good place to stay at respectable/reasonable prices for the purpose and length of visit. It did the job for a business traveller. I ate lunch and dinner in the hotel and the food was good. I had breakfast in the cafe next door which had decent coffee and breakfast. No complaints from me. Got in at 10:30 pm, there was no one at the front desk. Used the phone, let tiring and ring. Finally saw my reservation and room card, on the inside of the counter. Reached through the cage and grabbed the card. Other than that the experience was very goo. Bed was great, room was quiet! We weren't overly impressed with the hotel. Firstly, the air-con did not work so it was quite warm in the room at all times. Secondly, we had a sound coming from the bathroom that sounded like someone above/below was having a shower or flushing a toilet, however it was continuous the whole time we were at the hotel. Lastly, there was a fire alarm on Sunday morning at 5am, and everyone evacuated to the meeting point, however we never got told that it was safe to go back inside. Another guest just told us that it was safe to do so. I thought that was very unprofessional. The best things about the hotel was that it is one of the few hotel with a resturant in it at Gladstone though it does close early evening. It is where most of the business travellers come and stay. The rooms are quite run down since it is an old property. Housekeeping needs improvement and the general appearance of the hotel exterior badly needs a major upgrade. The resturant serves decent food but closes too early in the evening so if you are late from work, you might have to go to bed on an empty stomach. 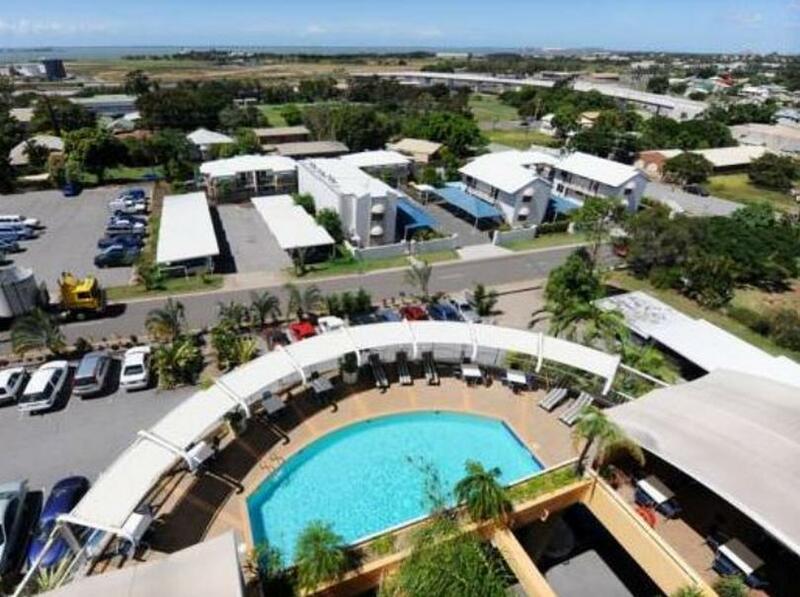 All in all, with only a few options to choose from at Gladstone, rydges may just be the right choice. excellent location and friendly staff. Internet charges is reasonable.